Venom could have been beautiful, an R-rated story of the symbiotic relationship between a man and an alien creature resulting in the creation of an iconic villain – but it isn’t. The movie isn’t terrible, it’s a perfectly passable popcorn flick, but it doesn’t really do much to separate itself from the hordes of other superhero films out there these days, and when it’s over, you feel like it needed to. 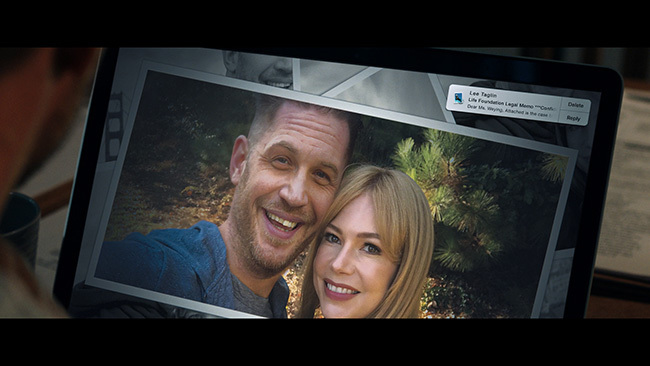 Regardless, the story revolves around an investigative reporter named Eddie Brock (Tom Hardy) who works out of San Francisco. He’s been tasked with interviewing Carlton Drake (Riz Ahmed), the CEO of a company called The Life Foundation. A hyper-intelligent man of science, Drake is really into the idea of space travel and sees endless possibilities and opportunity in exploring the universe. His luck changed when, while on a mission, a ship he is on that is carrying alien symbiotes, crashes on Earth. All but one of those symbiotes is found but one manages to escape. Brock confronts Drake during the interview about some of his less than ethical business practices and is escorted off of The Life Foundation’s property. Adding insult to injury, that same day his girlfriend Anne Weying (Michelle Williams) is fired from her job for letting Brock access confidential information. As such, she breaks up with him. Eddie isn’t having the best day at this point and sometime later, he’s still looking for work. When a Life Foundation employee comes to Brock with information about the accusations he levelled at Drake during the interview, he takes it upon himself to make his way into the company headquarters and see what sort of evidence he can find. He soon finds out the hard way that Drake’s plans involve merging humans and those alien symbiotes in the hope so of creating a hybrid being capable of living in space. Soon enough, one of those symbiotes has decided to use Brock for a host, at which point his body and mental state start to change and drastically. From here on out, he starts to change into the creature known as Venom and as Brock tries to get a grip on the newfound powers he’s acquired, he also tries to survive the counterattack from Drake and also deal with the existence of an all together different symbiote more even more powerful than he. Lots of flash and style, very little substance – that’s Venom’s main problem. There was a lot of opportunity here to really flesh out Eddie Brock and to dramatize the internal conflict he has to deal with once the symbiote attaches itself to him. Hardy is an actor more than capable of handling this, making it all the more of a shame that rather than go this direction, director Ruben Fleischer opted instead to replace all of this with tepid attempts at humor and fairly generic action set pieces. Granted, some of those set pieces are inspired and creative so long as you don’t mind the obvious CGI work involved in creating them, but what should have been a more character-centric piece has instead been turned into a fairly generic superhero adventure movie. 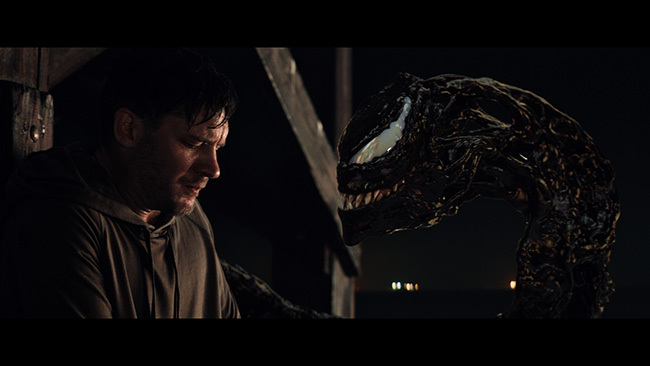 The movie also waters down Venom’s villainy to a pretty strong degree, likely in an attempt to keep things at a PG-13 level and give the film more mass appeal – but it doesn’t make it a more interesting movie. Quite the opposite, in fact. Still, Hardy is more than watchable in the lead. If his performance is uneven that would seem to have more to do with the writing than his acting. He’s enthusiastic and he has good screen presence, enough charisma to pull it off. 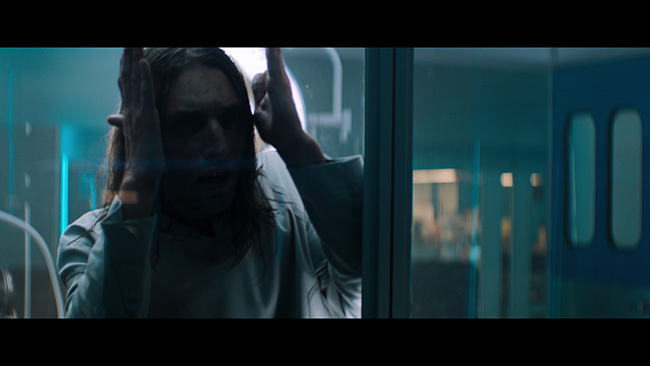 Riz Ahmed is entertaining enough as Drake, the film’s primary villain, and is plenty fetching as Brock’s girlfriend. 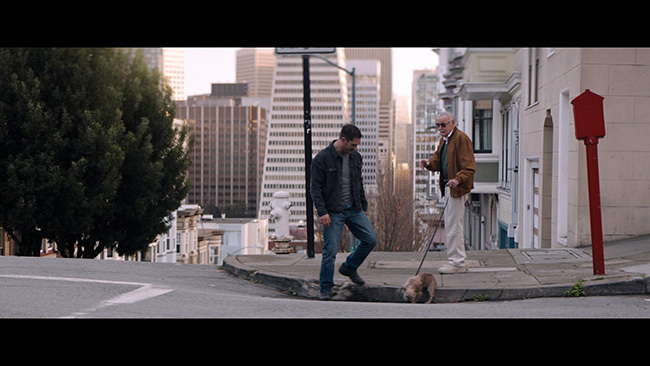 The obligatory Stan Lee cameo is amusing and the after credits sequence worth sticking around for. But you can’t help feeling a bit let down by this once it’s all over and done with. The superficial surface-level thrills offer no real lasting effect, and the lack of proper character development is disappointing. 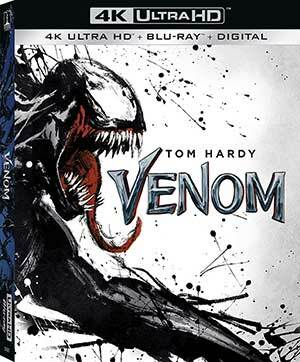 Venom arrives on 4k UHD from Sony framed at 2.35.1 widescreen and presented in 2160p with Dolby Vision and HDR in an HEVC / H.265 encoded transfer. 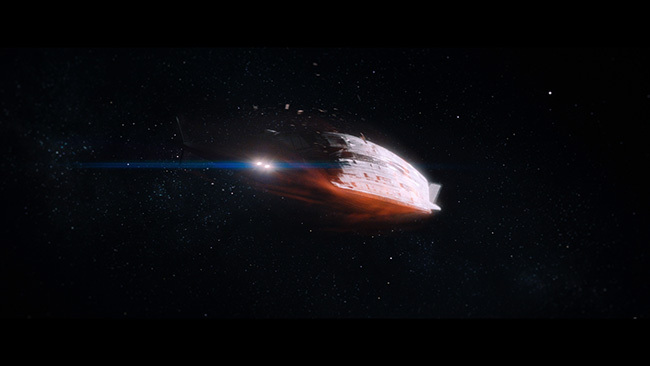 Reportedly, this was shot with a few different digital cameras and in varying degrees of high definition with the CGI rendered at 2k. regardless, the image here is very strong and occasionally amazing. Some shots do look stronger than others and some shorts are noticeably softer than others but there’s nothing here that looks ‘bad’ at all. Is the 4k disc a huge upgrade over the included Blu-ray? At times yes, and at times, no, but it’s always impressive and those moments where it shines, it really shines. Color reproduction is perfect throughout and we get reference quality black levels. 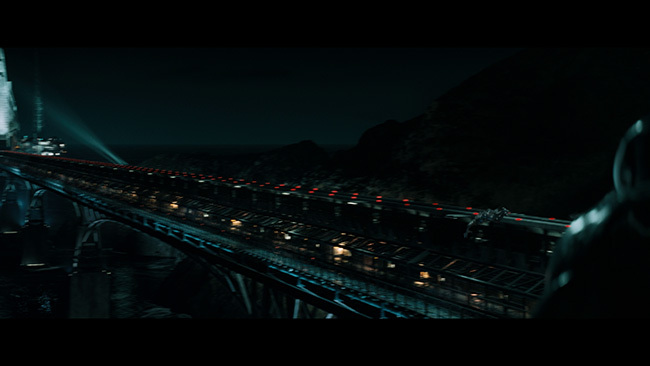 The night scenes are very impressive here, and contrast is spot on as well. Detail is at its best when CGI isn’t involved, so shots involving facial close ups and items with lots of texture like clothing reveal quite a bit more than the Blu-ray does, while those with an overabundance of digital effects don’t quite match up. Generally speaking, however, this is a very strong transfer with moments that qualify as demo-worthy. The English language Dolby Atmos track on this disc is impressive in every way you could want it to be. Surround activity is near-constant here, often bombastic but sometimes appreciably subtle using faint background details to help build scenes. Dialogue is crystal clear and, as you’d guess, there are no problems with even a trace of hiss or distortion. Bass response is powerful and strong but it manages to do this without muddying up anything else in the mix. Rear channel activity is great, the action scenes really come to life and pull you into things. Explosions send debris flying past you, bullets fire with plenty of power behind them across the soundscape and the score is spread out beautifully and with the kind of clarity that makes it easy to notice all of the different instruments used in the various compositions. Optional subtitles are provided in English, English SDH, French and Spanish. Optional English Dolby TrueHD 7.1, French DTS-HD Master Audio 5.1 and Spanish Dolby Digital 5.1 options are also included. The only extras on the UHD disc itself are a preview for Spider-Man: Into the Spider-Verse and the optional Venom Mode. When Venom mode is selected, viewers are treated to a pop-up track that relays trivia, behind the scenes stories, Easter Eggs and more. The Spider-Verse preview and Venom Mode option are carried over to the included Blu-ray disc that also includes a fair bit more extra content. The Deleted & Extended Scenes section contains three moderately interesting trimmed segments running approximately five-minutes in total length: Ride To The Hospital / Car Alarm / San Quentin Extended. Those expecting ‘R-rated’ material to be found in here, however, will be disappointed. From Symbiote To Screen is a twenty-minute documentary about the history of Venom in comics and how his ongoing popularity in those comics led to him getting a big screen adaptation. Interviewed here are Avi Arad, Matt Tolmach, Ruben Fleischer, Oliver Scholl and Kevin Smith. It might have been more poignant to get some of the comic creators who came up with Venom to appear here, but that didn’t happen. Regardless, it’s a nice primer on the history of the character. The Lethal Protector in Action is a nine-minute behind the scenes piece that features interviews with some of the crew members and explores how some of the more action-intensive sequences from the movie were accomplished. Look for info here on the film’s use of drones, the motorcycle stunts and more. 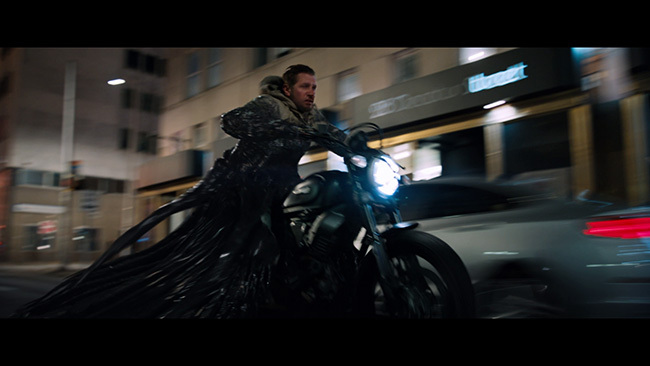 Venom Vision is a seven-minute piece that explores how director Ruben Fleischer came onboard to direct the project. We learn here how he put together the team of people he wanted to work with, and in interviews with cast and crew members, what he was like to work with on set. 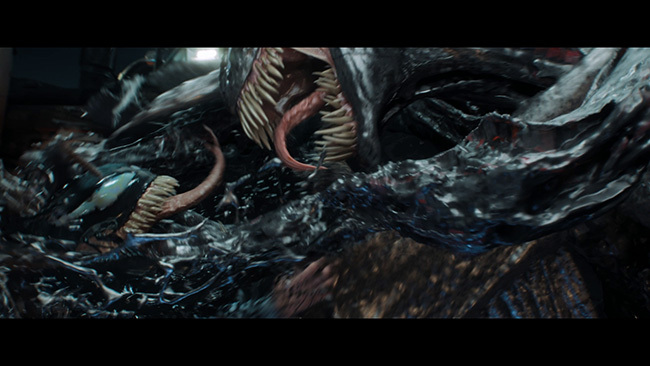 Designing Venom is a six-minute piece that examines the CGI that was used to bring Venom to life in the film while the three-minute Symbiote Secrets piece explores some of the little details that are peppered throughout the film that some less familiar with the character could easily miss. 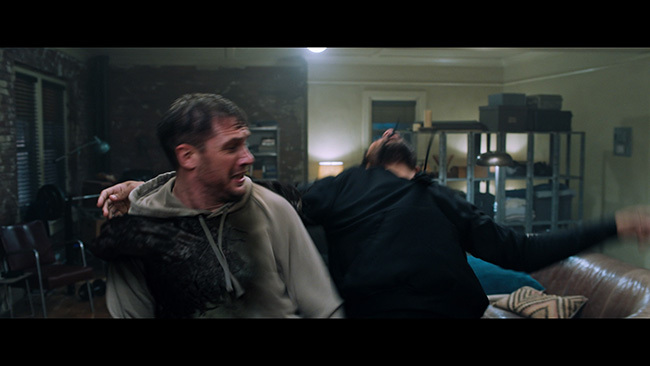 Also included here are Eight Select Scenes Pre-Vis sequences (fourteen-minutes of footage showing how the VFX progressed from storyboards to finished scenes), a music video for the track Venom by Eminem and a music video for the track Sunflower by Post Malone and Swae Lee (from Spider-Man: Into the Spider-Verse). Menus and chapter selection are also included on both discs. As this is a combo pack release, we also get a Blu-ray disc containing the same extras as are found on the UHD, and an insert card for a digital download of the film. This release comes packaged with a slipcover. Venom is flawed, an imperfect film that at times feels like a wasted opportunity. That said, it has moments that really work and Tom Hardy is solid in the lead. 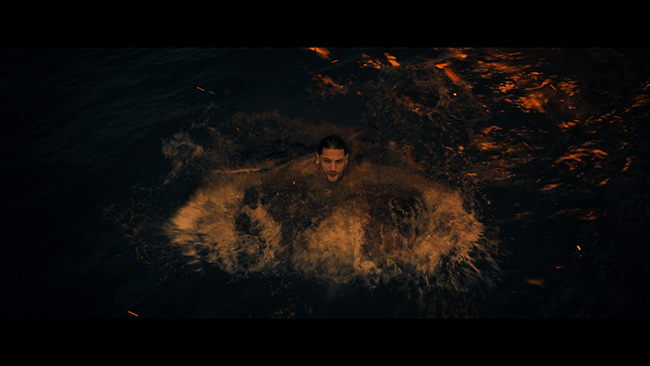 The digital effects are clearly that – digital – but they are well handled and the production values here are strong. Sony’s 4k UHD/Blu-ray combo pack release feels a little light in the extra features department but the transfer and the audio more than deliver the goods. 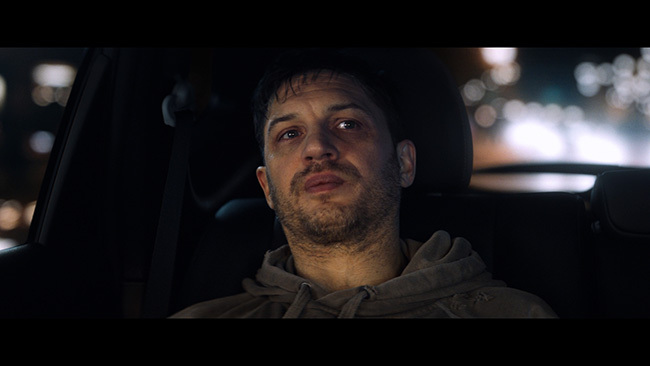 Click on the images below for full sized Venom Blu-ray screen caps!